Today I got home early enough from work to whip up some dinner rolls. I often have to resort to biscuits because of lack of planning on my part. We are going to indulge ourselves with some of my yummy ham and bean soup but we really need some bread to go with it. These dinner rolls fill the bill. This recipe takes less than two hours from start to ready to eat which includes rising time and baking time. Add dry ingredients to your mixing bowl and mix. Next add water and oil. Now it is time to knead. I prefer to use my stand mixer for this but you can use a bread maker or even knead by hand. 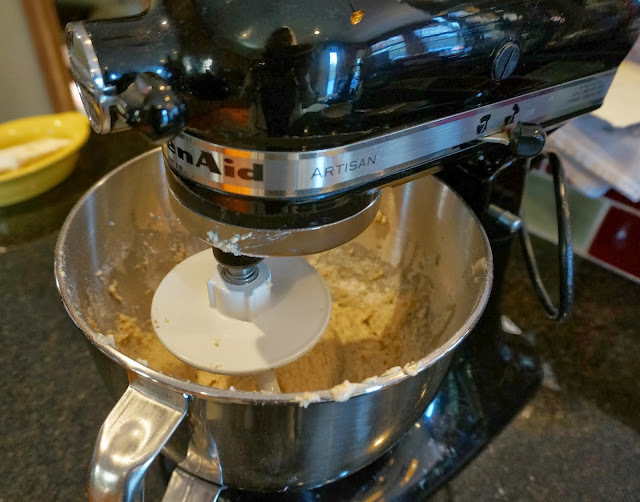 In my stand mixer I knead the dough about 8 minutes. Remember, if you are using whole grain flour, this type of flour takes longer to adsorb water. Do not decide you need to add water until after at least four minutes of kneading. If your dough seems dry and does not come together into a ball, add water a teaspoon at a time. If your dough seems super sticky, add flour a Tablespoon at a time. You want a firm ball of dough that is somewhat sticky. After kneading put your dough onto a heavily floured surface and generously flour your hands. Divide the dough in half, then divide each half in half. Then one more time divide each quarter into half until you have eight fairly equal sized pieces. Roll each piece into a ball and place into a greased round cake pan, seven around the edge and one in the center. If you are using a square pan make 9 balls and line them up in 3 rows of 3. Spritz the top of your dough with olive oil and over the pan with plastic wrap. The oil keeps the plastic wrap from sticking. Leave the pan on your counter for 40 minutes to an hour or so to rise. Once you have lovely risen dough, remove the plastic wrap and bake for 25 minutes in a 375 degree oven. Remove from pan immediately to a drying rack and serve warm. Yummy! Wow - these look great - I'll need to try them soon. Thanks for linking up to our Marvelous Monday party tonight. Pinning! These look yummy! Thanks for sharing on the blog hop. I haven't made dinner rolls in a while. Think I might just make them again after seeing these yummy ones! Oh wow these baked up beautifully! I've not made bread with my kitchen aid mixer yet... but you've inspired me to do so with this recipe!... and now I'm going to check out your ham and bean soup recipe! Thanks for sharing! xo! Hi Lacey. I think I got a little carried away with the yeast with the rolls in these pictures (used more than the recipe called for due to unexpected cat help) so they are a lot "puffier" than they should be. But they are yummy. Thanks for stopping by. Those look wonderful! I'll have to try my hand at making them. I LOVE bread and these dinner rolls look amazing!! Thanks for stopping by Wonderful Wednesday blog hop. I pinned you post! Yum! Nothing beats fresh rolls! Mmmm, this bread looks so good, nothing like fresh baked bread! I remember the days when I use to get home and do this for my family...now it would just be me and the hub...but for all of you families out there...your kids will love it if they come home to fresh baked rolls. Thanks for participating in our blog hope...have a great weekend. Now those look amazing. Can't wait to try them out. Thanks. Wow! These are some amazing rolls! I love making dinner rolls to go with our meals, especially chili and soup. It's just a perfect filler. But I'd love to try your recipe - I just love how they look and I know they must be delicious!